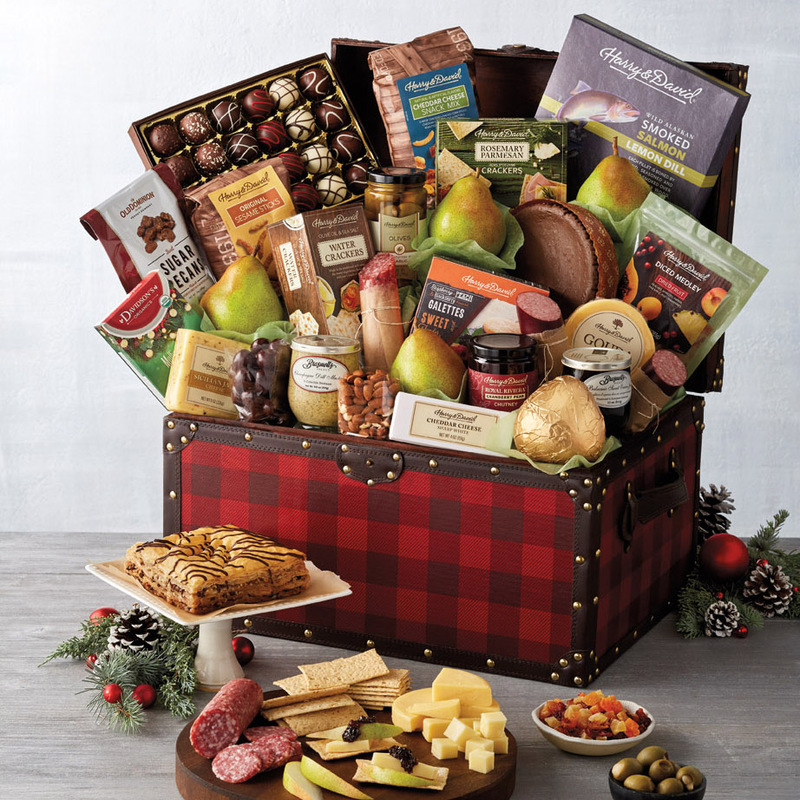 Looking for the perfect holiday gift basket for that foodie friend? 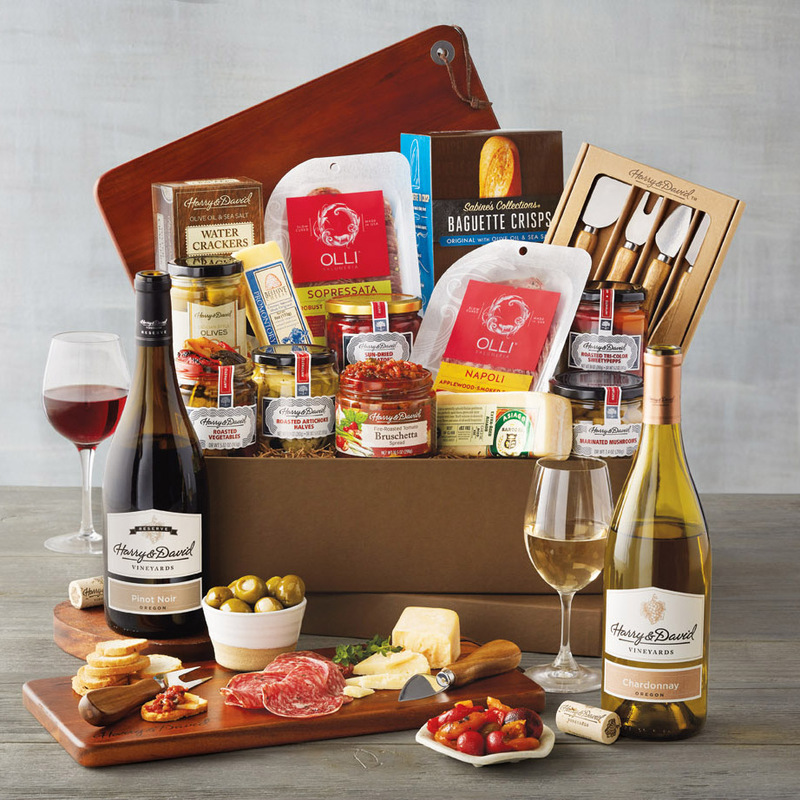 Look no further, because whether they like savory snacks, wine and chocolate pairings, or help with hosting, we’ve compiled a list the 10 tastiest gifts baskets for every foodie on your Christmas list this year. During the holidays, there is no shortage of reasons to celebrate, so why not give them something to celebrate with? 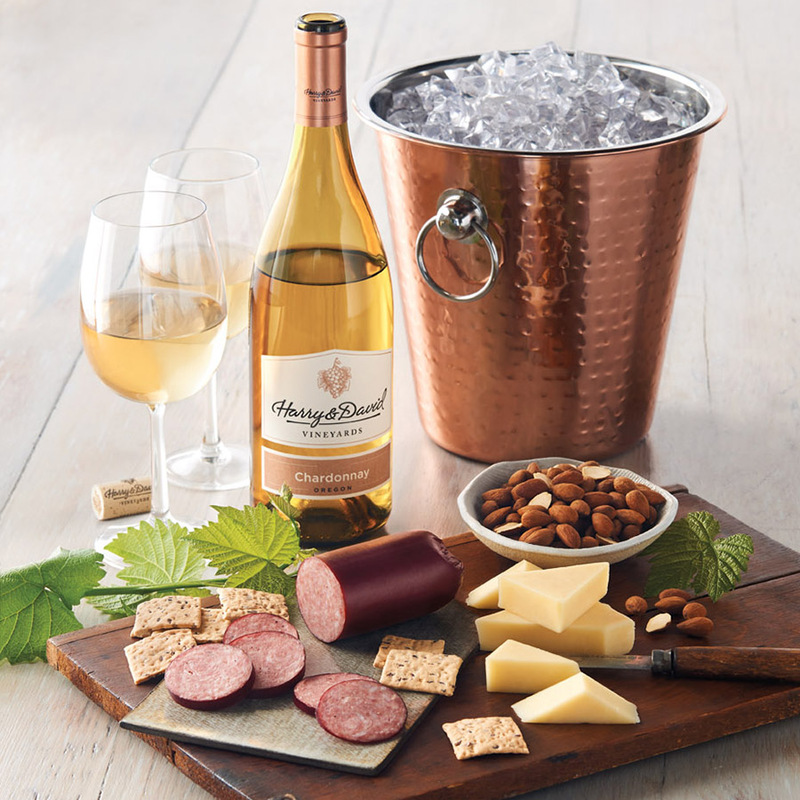 This elegant, hammered-copper wine chiller comes will a bottle of award-winning Harry & David Chardonnay and some tasty snacks, perfect for your charcuterie spread. This Christmas gift is perfect for the true wine-lover in your life, and the fun wine accessories will come in handy long after the wine has been enjoyed. 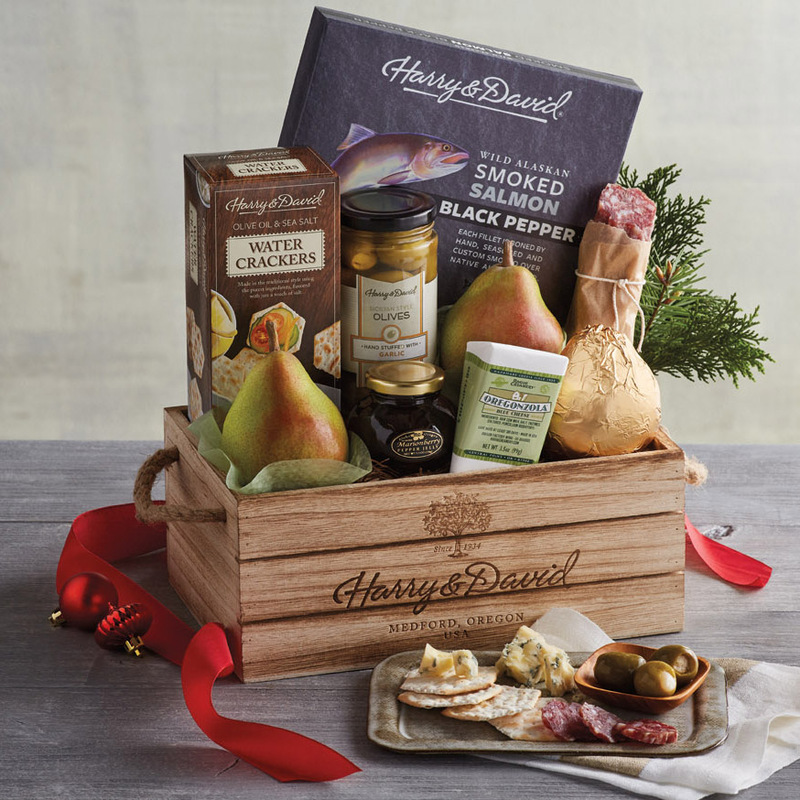 This gift, perfect for a wine aficionado, comes packed with Harry and David’s Riesling, Pinot Noir, and Beeson Tempranillo Dessert wine. Each bottle is expertly paired with a delectable dessert prepared in our bakery. 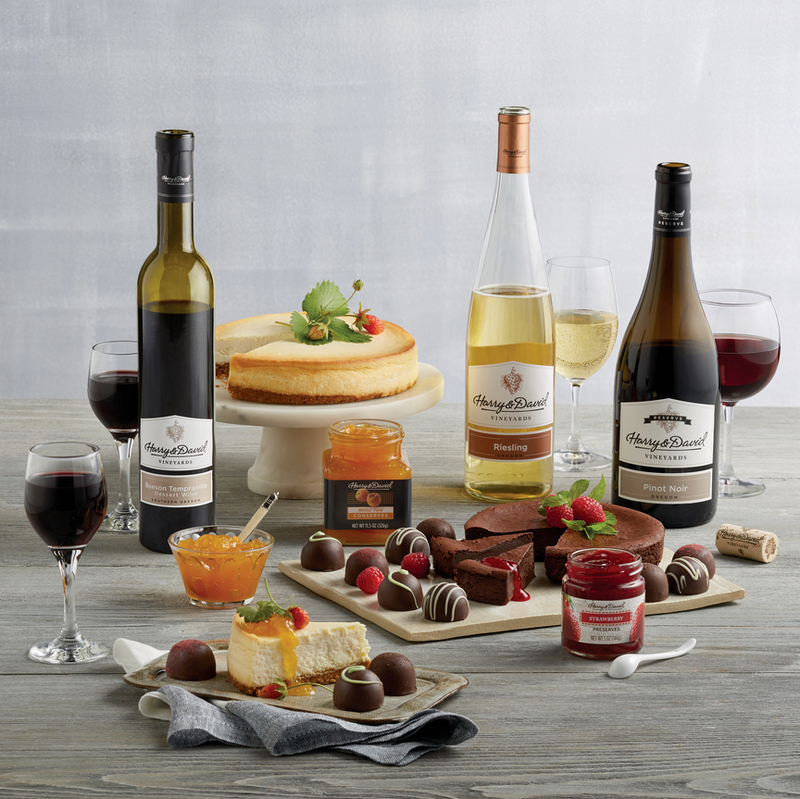 Whether they break into this set for a quiet evening at home or a New Year’s Eve bash, this trio of wine and dessert pairings make an extra sweet holiday gift. Not everyone on your gift list has a sweet tooth! 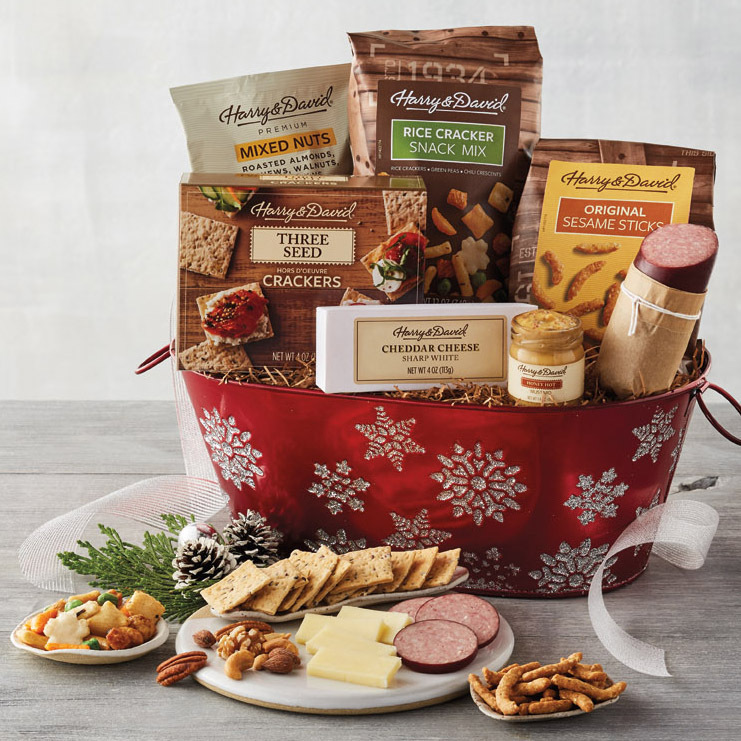 This gift includes rice cracker trail mix, delicious hickory-smoked summer sausage, premium mixed nuts, and much more. Everything is hand-packed into a festive, reusable tin and topped with a Christmas bow. We found the perfect gift for your holiday hostess! 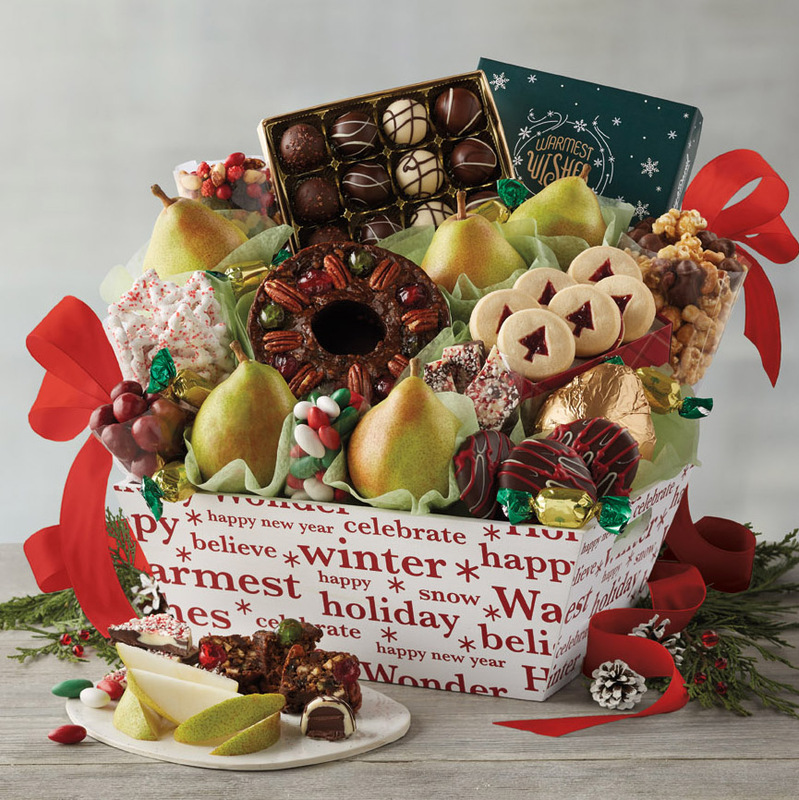 We like to call this “a party in a box,” because this gift holds everything they’ll need for a delicious evening. This one is a charcuterie lover’s dream come true. Don’t show up to the Christmas party empty-handed! Everyone brings the hostess a great bottle of wine, but you can make your gift stand out with this Wine Connoisseur gift tote. 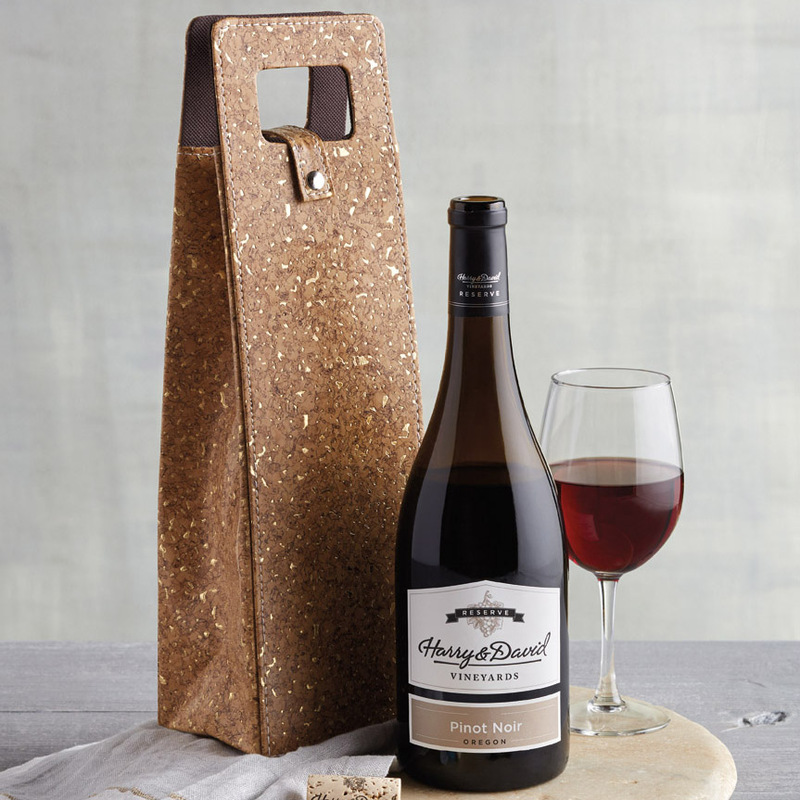 This compact gift comes with a bottle of our award-winning 2015 Reserve Pinot Noir and arrives in its own leather-like, snap-front tote. After Christmas, the last thing anyone wants to do is cook a complicated meal. This charming stainless steel colander is filled to the brim with everything to prepare a complete, gourmet meal at home. 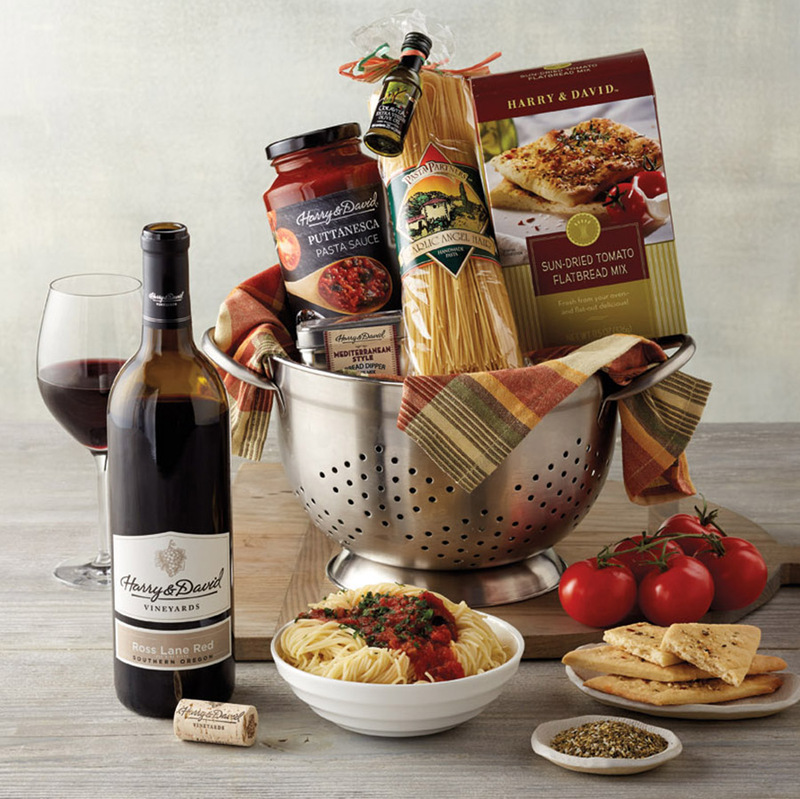 Whether paired with a bottle of wine or not, this gift basket is the perfect blend of practical and delicious! 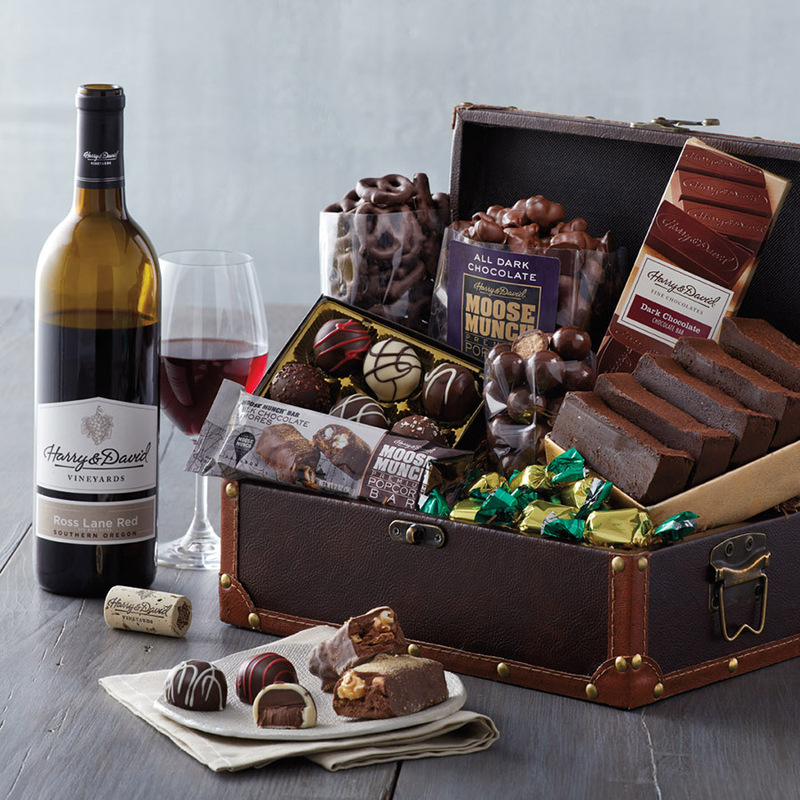 Delight someone with a wonderful keepsake chest brimming with indulgent sweets. This gift includes everything from buttery Moose Munch® Premium Popcorn to rich signature truffles from our candy kitchen. 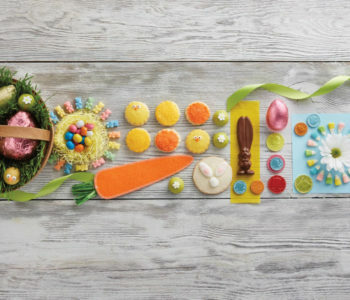 Order this treasure chest of goodies for the kiddo looking to stash their hidden treasures, and add a bottle of wine for the chocolate-loving grown-ups in your life. 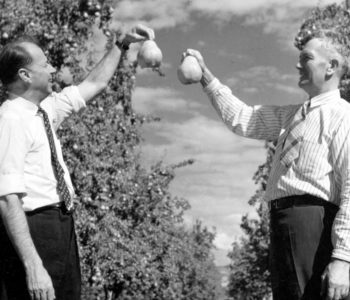 Whether they call the West Coast home or not, this gift is a delicious taste of Southern Oregon. 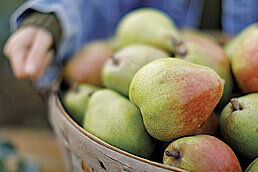 The reusable wooden crate arrives filled with juicy Royal Riviera® Pears from our orchards, Oregonzola® Blue Cheese from our neighbors at Rogue Creamery, and Taylor’s Sausage Smoked Beef Strips from the Oregon coast. This is sure to be one of the most unique gift baskets under the tree this year! Cozy up with this chest full of holiday treats. 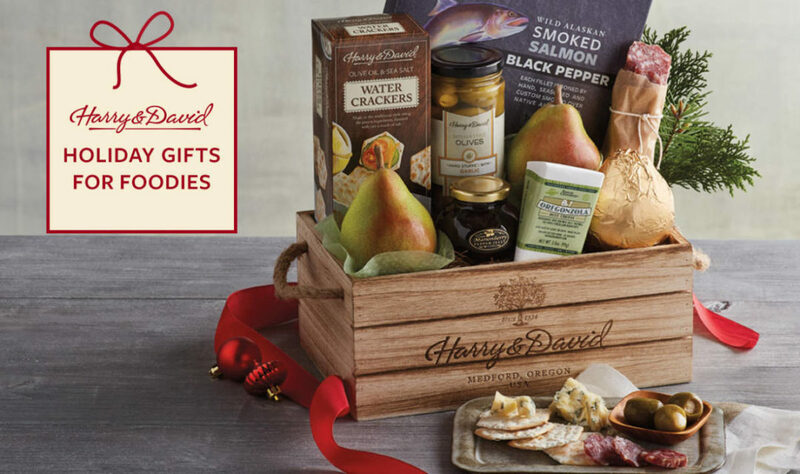 This keepsake gift comes packed with Royal Riviera Pears, gourmet snacks, and a variety of sweets from our Southern Oregon bakery. 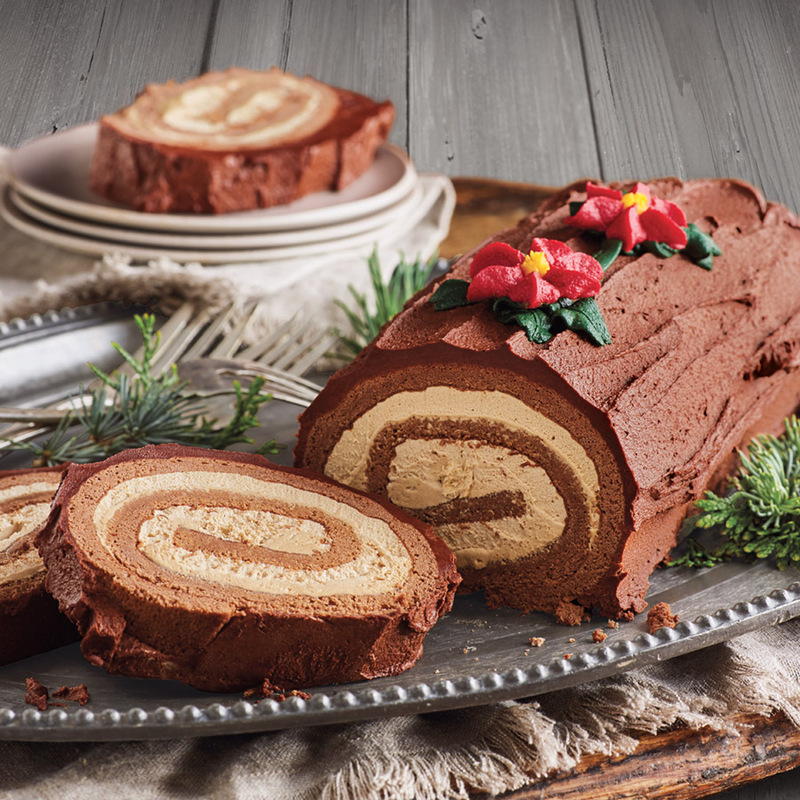 With so many tasty treats inside it makes a great gift for families, too! If all else fails, there’s nothing wrong with a gift basket packed with classic Christmas goodies. Signature chocolate truffles and our famous peppermint bark are sure to sweeten up any Scrooge! Harry this is one of the best looking christmas baskets gift i ever saw. very unique and special style. thank you ! What a very nice selection of gift baskets and each one beautifully displayed and described. This should be very helpful for someone trying to decide on a gift for that special person or occasion.